Whenever you hear that a car has a fault all things start going through your mind, such as how bad it is and if your car will start to display symptoms. We have come to expect this from most car manufacturers, and so it doesn’t come as a shock to hear of a Tesla Model S problem. However, it’s what that problem could be that worries us. Tesla Model S unintended acceleration is the first thing that you think of when you hear what happened to one owner. A complaint has been made to the NHTSA that a Model S accelerated suddenly while in a driveway, which saw the vehicle come to a stop with part of the car hanging over a 4.5-foot high vertical wall. The owner maintains that his wife was not at fault and did not put her foot all the way down on the pedal, but until Tesla launch an investigation we should refrain from holding judgment. It is understandable that there will now be Tesla Model S recall fears, but these are unwarranted at this time because the NHTSA isn’t even getting involved, as this is just one complaint and Tesla is handling it. However, we have to remember the Model S is the safest car on the road according to recent crash tests. 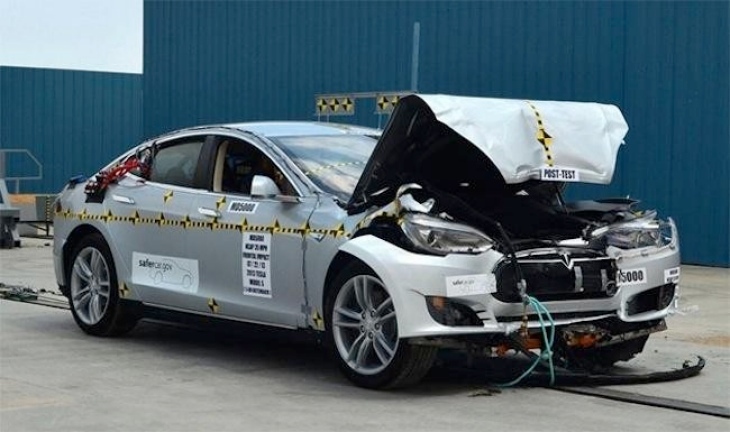 We have to wonder what Tesla Motors will find, but we do hope there is not an issue because the Tesla Model S issue could be reminiscent of the Toyota problems that affected the image of the Japanese car manufacturer badly? Do you believe there is an issue with the Model S, and do you think it is silly to even think about a Tesla Model S recall in 2013? In other news related to this EV, the European market is gearing up for the release of the Model S, and as such has already got a network of charging stations up and running. I don’t think there is an issue with the car, his wife probably made a mistake, it happens. But even in worse case scenario, this kind of issue can probably be fixed via OTA and no need for a recall.